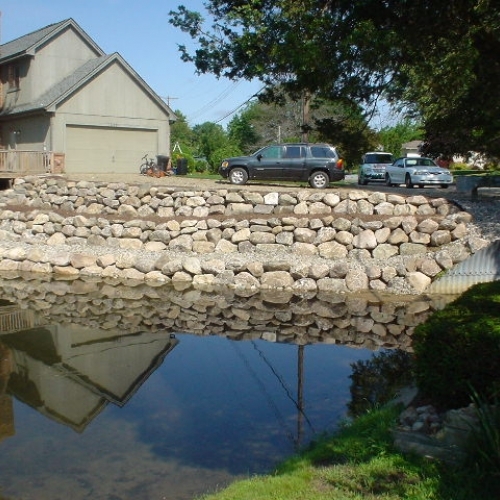 Protect your property and make your lakeshore more beautiful by adding a sea wall from Todd’s Services. This will help provide you with a functioning division between your land and the water by keeping the waves from eroding your Howell lakeshore. It will also add an extra element of beauty to your overall landscaping by framing your property and creating a clearer view of your lake in Michigan. There are several different types of seawalls that you can choose from depending on what your personal tastes are and the layout of your shoreline. Give us a call today so you can speak with someone on our team that will be able to help you determine what the best option will be for your lakeshore in Howell. Our company will also be able to help you get the seawall permits that are currently required by the State of Michigan Department of Environmental Quality. The job was done in a timely and organized manner and completed on time. I am very satisfied and plan to do more landscaping in next spring. Scott and Steve were great." I would especially like to be comment on the tremendous work ethic. The work team at the end of the day leaves with everything clean and organized." The guys who came to the house to install were very professional and amazing. They cleaned up everything and were very personable. Can't wait to get my patio done with Todd's!!" It was a big job, well done"